A nation has stirred. Provoked, it has risen. “Silence equals protest,” says one banner. The vast crowds move in a hush of indignation, anger distilled to a wordless essence. In greater numbers than ever before, Iranians had bought in to the sliver of democracy offered by an autocratic system whose ultimate loyalty is to the will of God rather than the will of the people. Almost 40 million voted. Now, their votes flouted, many have crossed over from reluctant acquiescence to the Islamic Republic into opposition. That’s a fundamental shift. "...in the western media, whose cameras focus so lovingly on Tehran's gilded youth and for whom Ahmadinejad is nothing but a Holocaust-denying fanatic. The other Ahmadinejad, who is seen to stand up for the country's independence, expose elite corruption on TV and use Iran's oil wealth to boost the incomes of the poor majority, is largely invisible abroad. 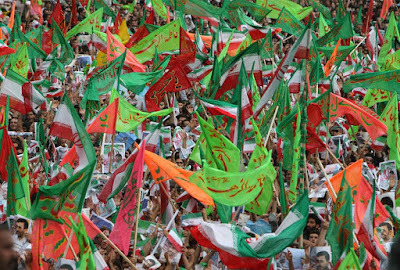 But such details have got lost as the pressure has built in Tehran for a "green revolution" amid unsubstantiated claims that the election was stolen. The strongest evidence appears to be some surprising regional results and the speed of the official announcement, triggered by Mousavi's declaration that he was the winner before the polls closed. But most official figures don't look so ­implausible – Mousavi won Tehran, for instance, by 2.2m votes to 1.8m – and it's hard to believe that rigging alone could account for the 11 million-vote gap between the main contenders. If Ahmadinejad was in fact the winner, then there is an attempted coup going on in Tehran right now, and it is being led by Mousavi and his western-backed supporters. But for the demonstrators facing repression in Tehran, the conviction that they have been cheated has created its own momentum in what is now a highly polarised society. That is given more force by the fact that the protests are underpinned by a split in the theocratic regime, of which Mousavi and his allies are a powerful component." Ahmadinejad won. Get over it.